Shirley Temple was one of the most amazing child performers of all time, perhaps the single best ever on film. Watching her is usually a joy -- but even with her presence, it's tough to watch The Littlest Rebel for several different reasons. The 1935 film, set during the American Civil War, stars little Shirley as the pampered daughter of Southern gentry living on a Virginia plantation. The film opens before the War at the birthday party for young Virgie (that's Shirley... Get the pun for in her character's name?) During the party, all the children call for one of the slaves to dance for them, which he happily does. Then all the black slave children present Virgie with a black doll, which she graciously receives. All the slaves are so gosh darn happy to be able to serve Shirley's family. 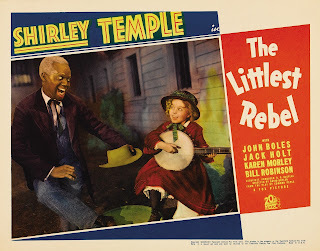 When war breaks out, Shirley asks slave Uncle Billy (the great Bill "Bojangles" Robinson) why there's a war, and he responds, "I guess some fellow in the North wants to set us free, but I don't know what that means." The happy slaves do their best, throughout the war, to aid the Confederate cause, but even their best efforts fail. It's up to Shirley to save her father and preserve Southern honor. Remarkably, Shirley does not age a visible day throughout the four years of conflict. Though set in Virginia, the entire film was made in a California studio. We can hope for a more truthful telling of the black experience in a couple of films coming out later this year. The Birth of Nation (not D. W. Griffiths' racist epic) will be released later this year. Directed, written, and starring Nate Parker, the film tells the story of Nat Turner's slave rebellion (if only he'd known the joy of living on little Shirley's plantation). That film is set and was filmed in Virginia, as is another film coming out this year, Jeff Nichols' Loving. That film will tell the true story of a couple imprisoned for the crime of interracial marriage in 1958. A different bit of dubious history for children is found in Disney's 1995 animated feature, Pocahontas. This telling of a Virginia tale was not filmed in any part of the real world, let alone Virginia. For a much better telling of that story, turn to Terrence Malick's 2005 feature, The New World, which was filmed in Virginia. There are too many Virginia films (set and filmed in the state) to discuss here, but I'll mention one last historical film: Steven Spielberg's Lincoln has many scenes set in Washington, D.C., but it also has scenes set in Virginia. From what I can tell, the great majority of it was filmed in Virginia. Man, oh man, do I wish I could cast a ballot for Honest Abe this November. 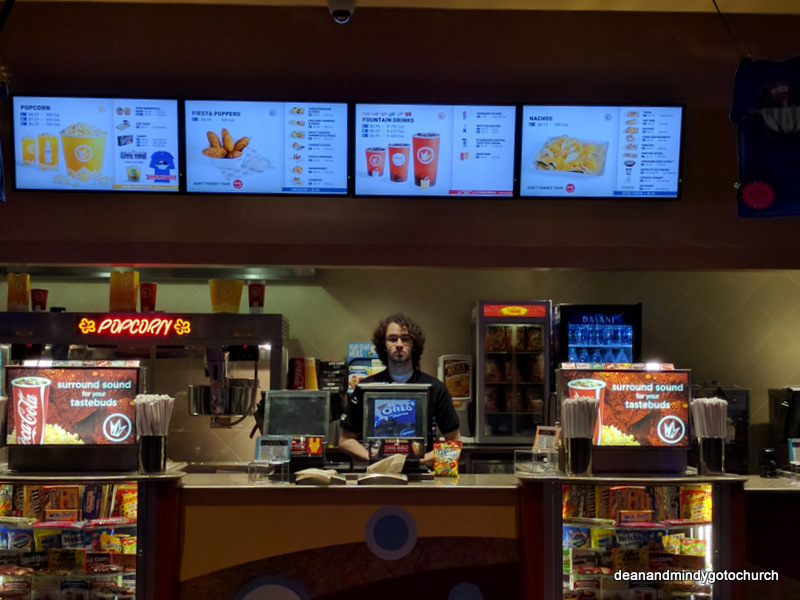 I've complained some in these parts about Regal Cinemas, so when our friends in Louden Country, Virginia, suggested going to a Regal to see Captain America 3: Civil War, I was less than thrilled. 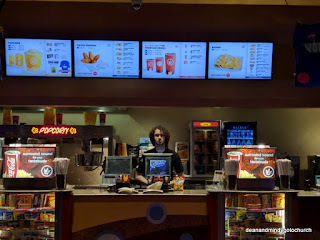 Fortunately, this proved to be a very nice theater compared to the Regals we attended in the past (just as the Civil War in the film was much better than the Civil War in The Littlest Rebel). The staff of the theater was pleasant and competent, the film was well projected, and the seats were very comfy. My only complaint would be the TV commercials that preceded the trailers and the fact that there were twenty minutes of trailers. We enjoyed the film very much, particularly the introduction of a new Spiderman. Finally, a high school Spidey that looked like shaving was a new thing to him. Turns out this new Captain America film even had a memorial service in a church. Not only is the setting used for a somber service for a beloved character, it was also interesting to see a church used as a place for moral reflection and choice. As it should be.